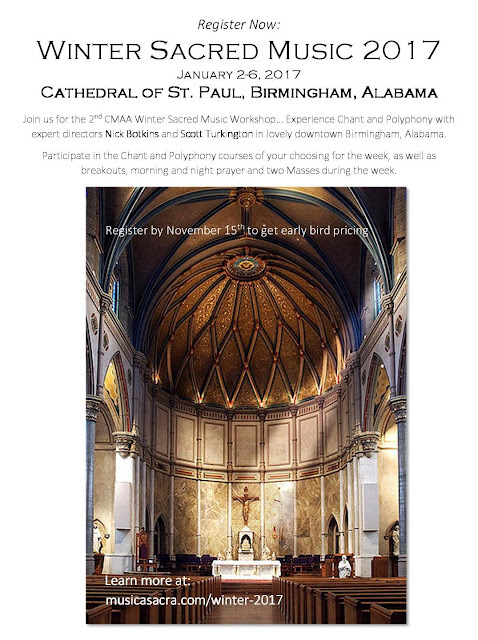 The Church Music Association of America will hold its Winter 2017 Sacred Music Workshop in Birmingham, Alabama, from January 2 to the 6th. This five-day workshop offers participants the opportunity to study chant and polyphony with outstanding directors Scott Turkington and Nick Botkins, as well as some lectures by Dr William Mahrt, President of the CMAA Board and Associate Professor at Stanford University. (Also the publisher of NLM!) The full program and explanation of all of the different study sessions which are offered can be see here at the CMAA website: http://musicasacra.com/winter-2017/; online registration is available at https://shop.musicasacra.com/. Early registration is still available until November 15th, so there is time to save $50; CMAA members also save an additional $5.